Update (admin) Castle Promotion have apologised and are withdrawing the product. The statistics tell the story. Violence against women is an epidemic worldwide - according to the UN, 35 per cent of women experience it. In the UK, seven women die at the hands of a current or former partner each month. In Australia, it's four women a month. Domestic violence is not only physical - it is emotional, financial, spiritual and includes threats, intimidation, gaslighting and isolation of the victim. All of these behaviours are about control of the victim by the abuser. All of these behaviours are a choice, influenced by what abusers think - or have learned - is acceptable. Domestic violence is a choice and the smile on the man's face as he pushes the woman makes this 'funny'; it's meant to be amusing. There would be many men and women - those who are survivors, those whose loved ones have experienced domestic violence, or simply concerned citizens - who wouldn't find it amusing at all. There would also be domestic violence survivors - survivors of trauma - who would experience overwhelming and immediate reminders of their trauma (known as 'triggers') when seeing these kinds of images. This is reckless and irresponsible 'creativity'. There is insufficient outcry when so many women suffer and die as a result of domestic violence. Sadly, it is our attitudes that mean women's lives are somehow of lesser value. It isn't just perpetrators of violence who are the problem. We all have a role to play. It's in the way we teach our children about respectful relationships, whether we laugh at sexist jokes when we hear them, whether we react when we see abuse happening in front of us, or whether we laugh or are appalled when we see 'jokes' about domestic violence such as this vile bumper sticker. Every little bit counts. 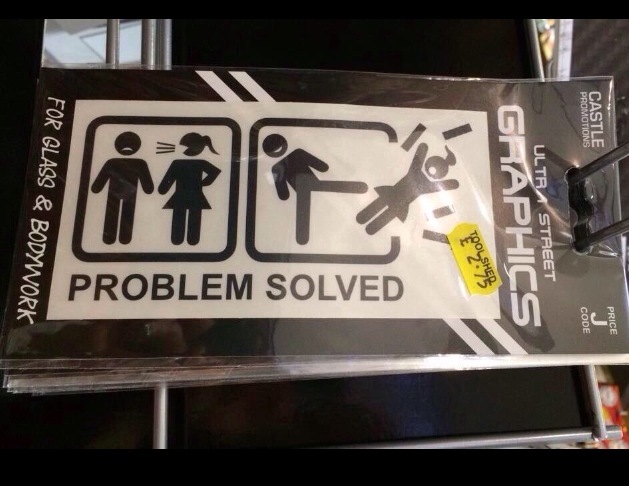 The fact that this sexist incitement of violence made it past some 'creative' type's sketch pad is astounding. It should be pulled from Tool Shed shelves and discontinued as a a Castle Promotions product. While you're at it, Castle Promotions, please donate the value of what you paid to produce this vileness to your nearest domestic violence shelter. They protect women who suffer the direct consequences of your idea of a 'joke'. Absolutely disgusting and horrifying. I’m surprised this was allowed to be produced. It feels as if society is going backwards, very depressing.